Window cleaning (domestic & general). Gutter maintenance. Conservatory cleaning. I will ensure that any job taken on will be fulfilled to a very high standard and to a very competitive rate. Extra charges are never added. Highly recommend, fast and efficient service, very friendly. Very happy with great service. We moved into our house earlier this year, and Andy has come out to clean the plastic window frames, eaves and bargeboards. The house looks hugely better as a result. Fifteen years' worth of grime - gone! Andy also cleans our windows on a regular basis. He is reliable, punctual and tidy. We can recommend him without reservation. First class job. Arrived on time. Worked well & left a clean finish. Would recommend to anyone. Andy did a fantastic job on cleaning my conservatory, which was extremely dirty. I would highly recommend him for his quality workmanship, great service and reliability. Prompt, friendly and professional. Job well done. Had a problem with my guttering at the back of the house got in touch with Andy to give me a quote, as we was talking asked about renewing my guttering Andy said why not clean should come up well. Price agreed came out on the 19/9/18 and Andy was not wrong came up a treat 21 years of grime gone excellent job good price would recommend. Excellent service. Polite, on time. Windows look like new. Good product used to clean all plastics. Lovely gentleman, polite and friendly. Professional service was more expensive than other companies but paid more for the overall experience. Andy cleans our windows 6 weekly and has just cleaned the whole of the outside of our conservatory. Absolutely excellent work. No shortcuts perfect result. Excellent job from polite, friendly and a very efficient team. Thank you! Andy told me when he quoted for the conservatory clean, that he was obsessed with the fine details of a clean and settled for nothing less than perfection. He was true to his word and my conservatory now looks like new after all of the dirt and green was removed. A very professional job. Efficiently and cleanly carried out. Andy was prompt on the morning of cleaning the conservatory. He is very knowledgeable about the products he was and is very proud and enthusiastic ensuring his work is perfect and that I was happy with the results. A bit on the expensive side but worth it. Worked hard, good quality work, polite and friendly. Andy did a superb job. I asked for gutters cleaned but he did more actually repairing a fault. All within quoted price too. Turned up when he said he would even though weather was awful. Recommended. Andy was very professional and courteous he was punctual. When the job was finished it looked as though the guttering and fascias were brand new. Fantastic job and brilliant workman. I found Andy to be punctual and thorough with the work he carried out in a full exterior clean of windows and all external PVC material eg frames, fascias, soffits etc. I had not had such work carried out previously and whilst the cost quoted originally did not appear cheap, to see Andy work so meticulously and produce a well overdue "face-lift" for the property, the cost was worthwhile. I also appreciated Andy pointing out where some parts of the work, due to age/deterioration of material, did not necessarily look as pristine as the majority of areas he cleaned. Andy and Simon gave our conservatory a real face lift. It has never had a proper clean and consequently there were areas that really needed some TLC. Both worked very hard despite the weather being against them for times. A really good job done and a fair price charged. Thank you both. So rare to get a tradesman to turn up on time, work hard (through the rain), so committed to doing a fantastic job and absolutely lovely - can't recommend enough fantastic job for a fair price - will definitely recommend to friends and use again. Thank you. A thorough cleaning job completed in a professional manner. I am very satisfied with the cleaning of the gutters, fascia, soffits and all the windows. Andy Vincent is a very efficient and reliable person and I would recommend him to anybody. Very friendly, prompt, thorough. Excellent job, very proud of his work & rightly so. I found Andrew to be a top bloke. Took photos before and after to show what he had done and also provided good advice to reduce future problems. Andy did a great job in clearing the moss off our roof & fixing the broken tiles. We are very pleased that once again we used a trusted trader. Mr Andrew Vincent, Denby Window Cleaning: our conservatory glass roof and exterior windows needed cleaning. Andrew did all he said he would, he worked very hard on same and left them bright and sparkling, we will certainly use his services again. Very pleased, clean, tidy, worked hard, would recommend. Thoroughly satisfied with the work done, excellent job. Denby Window Cleaning removed the moss off my roof. Since moving into my property, the moss on the roof concerned me, particularly when I learnt that it was blocking my gutters and drainpipes. I had the gutters and drainpipes cleared last year but understood that the problem would only re-occur without removing the cause. 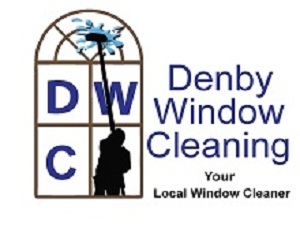 I was recommended Andy of Denby Window Cleaning who came out last November to assess the problem. However, he explained that the moss is best removed during dry weather so left me a quote and told me to ring again in the Spring should I require the work carried out. He carried out the work last week very professionally, removing all the moss, treating the surface afterwards and clearing up all the mess after him. My roof is now clear of moss and treated with a chemical that should prevent re-occurrence for a few years. As a favour, I also asked him to fit some anti-bird spikes which I supplied to the aerial - I believe pigeons on the aerial may be a source of the moss. Andy even did a bit of gardening for me! Excellent job, well recommended. Always friendly and efficient. Reliable and good service. We've been using Denby Window Cleaners for around two years. They provide a regular service and always do a good job, I also find them very competitive! Great to see a local business thriving! Andy does a first class job. Andy offers a professional service and to him it is a business. He has never failed to turn up monthly. He is a person who will go to great lengths to explain the system he uses in his day today business. The quality of the job he does has gained him a lot of business in the area, not least the cleaning of many gutters, facias and conservatories,including the roofs. Andy cleans my windows and does a great job. As he is local to where I live. Helping local small businesses is essential to me. Friendly chap - good job no fuss - recommended. Most pleasant and obliging young man. Very happy to give him another job when his diary permits. An excellent job with great efficiency.